How many kids love playing video games? Kids seem to really take to playing digital games, they offer a world of possibilities, challenge, problem solving and excitement. But do you know kids who are getting a bit too hooked on just playing them? Maybe you have kids who love these games and don’t seem to want to do anything else. Maybe you are worried that they are not learning much, or that they are just consuming all the time with-out making anything. Well here is a fantastic solution for you! In this post you will discover how you can change your kids from game consumers, to game makers, storytellers, creative thinkers, learning programming, design, reasoning, communication and collaboration skills. Getting kids to be creative with technology is actually not that hard, nor is it expensive. Instead of playing games all the time, would you like to see your kids having just as much fun learning how to make their own digital games? They can collaborate with others to create games, stories, and share them with a safe community of other children. There are many free and pay for options which I will cover in this post. They are all good for different things, some are for younger children, some for older young people, some for understanding coding concepts, some for learning specific programming languages, some for making animations, games, and some for coding physical things like robots. After this there are two more popular ones that are both free and supported by the Carnegie Mellon University along with other industry supporters. Alice which is aimed at teachers and kids from middle schools to universities, and is for programming fundamentals and introduction to Java, for animation and game development. Squeakland is aimed at younger children to learn to use ‘Etoys’, which is a child friendly computer environment in which children can make their own models, stories and games with simple coding. Neither are very active any more. Then there are two more specialised ones. Kodu is Microsoft’s free educational platform enabling kids to create games on a PC and Xbox. As an installation only, games saved on the hard drive, and no social media, so they won’t be collaborating online if you are worried about that. The MIT Education Arcade has 4 platforms to check out StarLogo Nova for creating 3D games and simulations for understanding complex systems, as well as Taleblazer for Augmented Reality games and Gameblox for making games. It’s free, aimed at students and teachers, but hasn’t been updated in a while, the developers are inactive at the moment. This software was developed for educational purposes, and is a community run by enthusiasts. Scratch is a project of the Lifelong Kindergarten Group at the MIT Media Lab. The community is currently very active and alive with new work uploaded almost daily, not sure exactly when the last update was but they are working on known issues with the Mac AIR, the next update is due in January 2019. It’s aimed at both educators and parents to be used with children and young people ages 8 to 16. The educator resources include a community, gatherings, tutorials & guides, which are for use in schools, museums, libraries, and community centres. The resources for parents are the online resources. This project is for getting children to make stories, games and animations as well as developing design, organisation and communication skills. It’s a programming language to encourage creative thinking, systematic reasoning and collaborative working. These are life skills for their future. Its largely plug and play script lines, drag and drop directions for what you want your character to do, it’s that easy, but it does teach children how to think like a coder, even if they are not learning an actual coding language. Overview – there is a huge enthusiasm for the power of creative learning here, using TED talks, Downloadable PDFs, and lots of information about how this product can help children’s development in all sorts of ways. It’s committed to children’s development and wellbeing, that’s it’s brief. It’s aim is to teach the concepts of programming in a fun way, so you will not be learning an actual programming language that is used today in professional applications. Lego is to engineering as Scratch is to programming. Most importantly, it’s fun. PRO’s – very easy to use, safe learning and sharing environment. Perfect for kids aged 8 and 9. Particularly good for kids that like maths. CON’s the browser based version is made in Flash which is no longer supported in most up to date browsers, however it is easy to fix this. Older teenagers may feel that the community of oversensitive to the content they wish to make. Its biased towards kids that like and understand maths, that’s not a bad thing, but it may limit some users, and you’ll have to go elsewhere to find and explanation of some of the mathematical concepts. Browser based. Also have apps for iOS and Android enabled tablets for learning basic programming concepts. There are also offers available now and again, such as 25% off lifetime plans. This is a commercial platform that offers self-paced online courses to learn coding for kids. This start-up was founded in 2012, and is still going strong. They have an active Twitter feed with frequent updates (almost daily), and they blog about 3-5 times a month. What makes it successful is that kids are encouraged to learn programming with game-like sessions where they can earn badges, so it’s fun. They are playing a game to learn, win win! These learning games are aimed directly at different childhood interests, such as ‘Coding with Barbie’ or ‘Goblin Quest’, games in haunted manors or the ever popular puzzles. They also have Minecraft mods and addons! So children will find something in there to spark their interest. Free version that includes 20 coding games, Minecraft private server. Thoroughly guided and looks fun. New courses are added as per the demand of new languages and previous subscribers have access to it. The Apps for phones and tablets don’t support the online courses. Here’s a video from the Teachercast channel with an interview with Dan Rezac from Tynker.com on to discuss STEM Education and how Tynker is offering educators a FREE professional development opportunity called the Blue Ribbon Educator Program. This is a community-run platform developed by Google and aimed specifically at teenage girls to inspire them to code. It has been developed to get more women into Technology and Computer Science jobs, these roles are getting more important, they are well paid and there is a huge shortage of women in them. 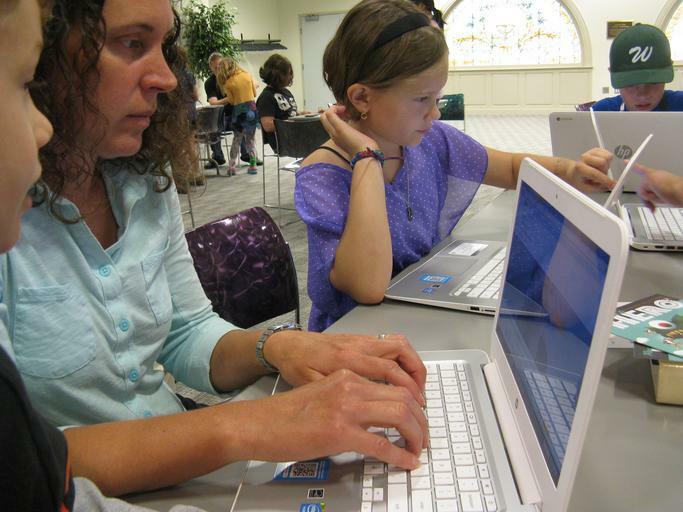 So get your teenage girls into coding, and it could change their future career! What makes this platform really special is the community aspect and the realy life projects that you can get involved in. It’s an open source platform where users are encouraged to communicate and share their ideas through technology so the ideas can be brought to life in the real world. You can get involved in various projects related to coding, designing, creating and see your work being used. Like a Snapchat Geofilter, design your own Emoji, mix music, make dance routines, make your own animated gifs to share. You can even host a coding party. Needless to say there is an active Instagram and Twitter page to help you share your creations. An open source educational programming language : “designed to teach logical and computational thinking skills, fundamental principles of programming and a first exposure to object-oriented programming”. Aimed at teachers and kids from middle schools to universities for a wide range of subjects from visual arts to the fundamentals of programming and introduction to java courses. It is used for animation, storytelling, building games and learning to program. First developed by University of Virginia in 1994 and then continued by Carnegie Mellon University. Run by the support of their partners and donors (Carnegie Mellon University, Oracle, Java etc.). Not as active as it was, the latest software version was launched in 2009. The twitter account is updated 2-3 times/month, but the last update in the website seems to be in 2017, and the last blog was in June, 2018. Out of date. Require updates in the graphics etc. OS: Versions for Windows, Mac and Linux. A free and open source educational tool for teaching children powerful ideas in compelling ways. Aimed at children to teach Etoys. Etoys is a child friendly computer environment and object-oriented prototype based programming language for use in education. Children use Etoys to make their own models, stories and games which keep them engaged. With the projects, they can learn math, science, develop their problem -solving skills, visualize and explore new ideas. Originally developed at Apple in 1996. Since 2010, it acts as a separate entity called Squeakland Foundation. Run by the support of their partners and donors. E.g. Carnegie Mellon University, Oracle, Java etc. They don’t seem too active at the moment, last update in their Twitter site was in 2017, last blog in 2010. Provides media rich authoring environment with simple, powerful scripted object model. Includes 2D, 3D graphics, images, text videos, sounds. Real-time sharing projects with other users. OS: Only available for Windows computers. A programming integrated development environment developed by Microsoft’s FUSE labs. No active social media. However, community seems to be active, sharing games amongst each other. A free educational platform that lets kids create games on PC and Xbox. A visual programming platform aimed at kids to create, play and share video games. Kodu teaches children creativity, problem solving, storytelling as well as programming with no prior experience and education through games. It has a feature that allows to view the game’s code. Creating a mood for the game with Sky and Lighting setting. Saving game to user’s computer’s hard drive. Choose which language is used. Kids can learn various aspects related to maths, computer science, digital technology, languages etc. through games. OS: Bowser based and downloadable versions for Windows, Mac and Linux. Gameblox – blocks-based programming tool designed for making games, no longer actively developed. Developed by MIT Scheller Teacher Education Program (STEP) in 2010. MIT STEP engages in many research and development projects which are frequently added in the website. Aimed at teachers and students (Upper Elementary through High School/College). StarLogo Nova is the most interesting product for this post, because none of the others offer this capability, simulation to assist students in exploring complex systems, grow interests in programming and make compelling, rich games and simulation models. Facilitating the creation and understanding of complex systems allowing to create educational video games. Also Tableblazer because it offers the possibility of making AR games. As an example of what you can do with this, here is a video of a fish pond simulation in StarLogo Nova. “Anyone can create technology not just consume it”. Generally aimed at kids between age of 6-13, but not exclusively. They want their products to be used by people of all ages. Learn to code, build your own computer, build a wand, create apps and games etc. with the help of their kits. They sell kits that can be integrated with user’s devices so they get to build, create, play and collaborate. Active Twitter, Facebook and Instagram account with 3-5 updates/week. Also, the community is active where they share their designs. They offer 2 products: Coding challenges/creations are provided for free in their website. Their core product are physical kits that allow users to learn to code and build stuff to use the code in. DIY computers and robots (Kano Computer, Harry Potter magic wand etc.). You can follow instructions in a book. The prices for kits depend on type. Widely used in schools around the world, aimed at both primary and secondary schools. The microbit has various sensors, pins and LEDs, that can be programmed in Python programming language. This is an open source project, run by a foundation and supported by companies and communities all over the world working together to help young people learn to code and become confident and creative with technology. A similar concept to the micro:bit, but with different functions on the mini-computer. The Raspberry Pi Foundation is a UK-based charity that works to put the power of computing and digital making into the hands of people all over the world. They provide low-cost, high-performance computers that people can use to learn, solve problems and have fun. They also provide outreach and education to help more people access computing and digital making. As well as developing free resources to help people learn about computing and how to make things with computers, and train educators who can guide other people to learn. There is a vibrant community with free online courses and many areas have clubs and events to bring together enthusiasts. There is an operating system for all models of the Raspberry Pi called the Raspbian which you have to download and install first. You download and install this on a microSD card, slot it into the Rasberry Pi, connect a mouse, keyboard, and monitor into the Rasberry Pi. Then you will be guided through initial setup (you’ll need WiFi), then you’ll get access to features such as programming, education, sound and video, graphics games accessories, help and so on. Download the EV3 programmer app onto your tablet, learn how to code in EV3, create a program, build a robot with lego and the EV3 motor blocks, and various sensors that you can buy, add in the EV3 computer black that you have programmed. Watch your invention work. There is a large community and lots of support. There are some amazing things you can make with this technology. The only downside is that it’s a more expensive option, but the options for creating are almost unlimited! So this has been a pretty comprehensive look at the possibilities for getting kids to make their own games, learn programming and even make and program robots and computers. If you have given these a try, please leave a comment below to say which ones you have enjoyed doing. Thank you! In in total agreement with this post, kids spend so much time on the computer just playing games. If they put as much energy in learning to code as they do playing then there would be a fare few experts in no time at all. For me my choice would be raspberry PI as I’ve had a little bit of experience with this already. Thank you Darren, nice to know that Raspberry Pi is a good one. Let’s share the article as far as possible and then more parents can see that there are many ways to get kids being more creative with technology! I have this little problem with my kid spending hours playing fortnite and after I read your article, this may be the solution instead of spending hour playing for nothing at least he can learn how to make his own games. I kind a like Alice since looks like to be for older kids. Do you recommend me Alice my kid is on middle? Thank you GVporras, yes Fortnite does take up a lot of children’s time doesn’t it! Yes Alice is still popular, but the thing with Alice is that it was developed in the 1990’s and isn’t really still in active development, so I would lean towards Scratch as there is a much more active community and it’s still actively developed. If you are windows based, Kodu might be the thing because you can make games on Xbox, and that might be more fun and relevant for a child who uses that. Try out the freebies and see what your kid likes the look of. Thanks for your question. What an excellent idea – getting kids to think up their own exciting games rather than just be in Zombie mode playing them all the time. I like the idea that they can collaborate with others online, but I think that would have to be under a parents supervision, as there are just so many people out there up to no good. If you don’t have the time to supervise your kids online, the Kudo looks like a great platform to start them on. Let’s get that creative thinking to start coming through. Thank you Michel, completely agree! Thanks for the comment!